Mr. Keith Willcox, born in Groton, NY in 1947, was raised on his family’s dairy farm. After attending Harpur College, at Binghamton University, he married his wife, Nadene, and began a new chapter in his life. A conscientious objector to the Vietnam War, Mr. Willcox adhered to mandated community service as an orderly at Wilson Hospital in the Binghamton Tri-City area. After receiving his Master’s in Library Sciences, he transitioned into respiratory therapy as an in-home caregiver. His commute often entailed hundreds of miles a day, sometimes going as far as the edge of the Canadian-American border. 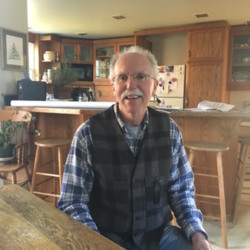 Although a relative newcomer to Roseboom, Mr. Willcox has lived in the township for 43 years and continues to participate actively in his local community. He explains transformations in the rural landscape of agriculture, discusses local politics, recalls community activities, and explores how full-time and part-time residents of the town have interacted. His personal stories illustrate a portrait of a man taking each day step-by-step. I conducted this interview at Mr. Willcox’s home in Roseboom, NY. His recollections of the past shed light on a rural lifestyle with which many people are not accustomed. I have attempted to capture Mr. Willcox’s style, mild manner, and good nature in the transcript as best as I could, and I have removed false starts and sentence fragments to capture the main idea as best as possible. However, I encourage researchers to consult the audio recordings, as it is impossible to reproduce the exact tone and particularities of an individual’s voice. This is Shiv Desai. Today is November 7, 2018. I'm with the CGP Community Stories and I'm at Mr. Keith Willcox's home in Roseboom, New York. Thank you for joining me. I'm good. Okay, let's get started. So tell me about where you're from and how you grew up. I grew up on a farm outside Groton, New York, which is not far from Ithaca and Cortland. Moved off the farm when I was about 15 into the village where the school was located and after completing high school, I went to college in Binghamton, met Nadene, got married. Who else was in your family growing up? Mother, father, two older brothers. Everybody's deceased. Did you have a close relationship with your brothers? Given that the age difference was so great, one was 13 years older, one was 10 years older so that put a limit on things, because by the time I was old enough to know what was going on they were mostly out of the house. The older one went in the Air Force after some college and the younger one went away to college and so on. But we got along alright. So what were some important issues in your community growing up? The community was kind of a microcosm of the Rust Belt, I guess. There was a typewriter factory in the center of town that made Smith Corona typewriters and sometimes you could smell it. What they put into the local stream was not good, but somehow we took pride in the fact that we had a factory, whereas all the other little towns were just farming communities. Issues, not so much. The election of John Fitzgerald Kennedy was a big deal because he was the first Catholic president and people were actually worried that he would be taking orders from the Pope, which of course didn't happen. There was concern about that. Yeah, my father sold the farm because he realized that none of us, none of the three boys, wanted it. Farming is hard on you as you get older. So you knew by a certain age that you did not want to go into farming? Correct. It was dairy farming. Cows have to be milked twice a day. If you milk them really well in the morning, it doesn't mean you don't have to milk them in the evening, you still do, 365 days a year. We didn't go on too many vacations, the longest one was when I was five. My parents and I went to California by car to visit my mother's sister and her family and my brothers and my father's father stayed home to care of the farm. But mostly we didn't get away much. Christmas, Thanksgiving, you still have to do chores. Besides the election of JFK, were there any other national events that stood out to you as you came of age or were growing up? Oh, not really. The town was overwhelmingly white. A black family would come and go once in a while. I do remember Selma and Martin Luther King, but that was mostly when I was in college. I remember when Martin Luther King was assassinated. I was in a Milton class in college, and the professor said, "Well, they finally got him," and it just kind of, that was it. We didn't talk about Milton that day. I was in high school when JFK was assassinated. John Milton. Yes. Paradise Lost. That's what the course was about but the professor didn't really feel like lecturing and we didn't really feel like listening. It was quite a shock. So, how did your family and community receive most their news or learn about--. Television. There were only three networks, unlike today. So we pretty much agreed on what the news was, what the truth was. The concept of fake news didn't exist. Did a lot of people in your area have a television to be able to talk about those things? Yes. The first one we had was black and white and eventually we got a color television. I remember there was a bar in Groton. So obviously I was in high school or I wouldn't have gone there, but they had a 24-inch color television but the colors were not quite accurate. People might be orange and skies might be greenish, stuff like that. You said you met your wife while you were in college at Binghamton? Yes. We both sang. She was actually interested in a friend of mine but she settled for me for which I'm profoundly grateful. And when did you both marry? Got married in September of 1970. She was still, well she had been majoring in biology, I got her to switch to English, but she wound up going to nursing school. She was still in school and we got married, I had graduated. And you were, what was your major? English. But you were a respiratory therapist. And how did you—how did that happen? [smiling] How did that happen? OK. The Vietnam War was on and I didn't really want to get involved with that so I became a conscientious objector, which meant that I had to do community service. They said that I could be an orderly at Wilson Hospital, which is one of the bigger hospitals in the Tri-City area, Binghamton, Johnson City, Endicott. So, that's what I was doing when we got married and I think I had to do that for two years but it wasn't much longer. Anyway, I went back to the placement office at Binghamton University and they said, “Well, you're an English major, why don't you think about library science?” I think they told a lot of people that and it wasn't great advice because there were a lot of liberal arts majors who wound up trying to be librarians, and there is an old saying: “Librarians never marry and seldom die.” So there isn't a lot of turnover. I did go to library school in Albany, got an M.L.S., Master’s in Library Science. My only library job was in a medium security prison downstate, and that was also when Nadene was pregnant with her first child. Anyway I quit that, came back up here, and got involved with health care. Respiratory therapy appealed to me because it only took another calendar year of schooling and then I could get a job. So there I was. And this was after you had moved? Yes, we moved from the Binghamton area to Cooperstown in June of 75 because Nadene got a job at Bassett hospital and I had been accepted at the library school at Albany and we couldn't afford Cooperstown and Roseboom is kind of in the right direction to commute to Albany, so that's how we wound up here in fall of 75. So how did your life change when you moved from Groton to, or from the Binghamton area, to Roseboom? Well, we kind of did it in stages. Our first apartment was in Binghamton. Fifty-five dollars a month including utilities. And then we moved to a small town outside Binghamton called Chenango Forks and then to Cooperstown. This is more like where we both grew up, she grew up on a farm in the Catskills and so the house is similar and so on, so it wasn't a big transition. You describe yourself as a newcomer to this area given that a lot of people have been here for a long time. How do you think that's changed your perception of this place as well as how you fit into the place? Roseboom, as a political entity, is only a township. There are, depending on how you count, three hamlets, possibly four, so one of them is Roseboom. It's quite different from Pleasant Brook or South Valley and there isn't that much interaction. So, what was your question? Oh, being a newcomer. I guess there are more newcomers here than there would be in South Valley, so it wasn't that big an issue. You learn to explain to the old timers that you live in Tug Brody's house. His name was actually Herbert, they called him Tug. Anyway, we bought the house from him and even though we have lived here longer than he did, certain people can identify the house if I tell them “Well, Tug Brody used to live there.” “Oh yes, I remember that.” But there's been more turnover since we've lived here. We've been here quite a while. The house next door has changed hands a couple of times and some of the others. Is there a reason why more people come to this area over time? I think the draw is Cooperstown. To some extent the opera, the Hall of Fame, the hospital's the biggest employer perhaps in the county, maybe the colleges are greater. People will live in a place like this and commute wherever. I commuted to Clinton, which is near Utica. Other people might drive to Albany. There aren't many jobs right around here. I think John Webb was instrumental in getting the whole interview process started. He's a great resource because he grew up here. And then he lived elsewhere for many years but he can tell stories about, for example, when the road out here was a dirt road. Things that were before my arrival. So what was your experience like commuting from here to Clinton for work every day? It wasn't just “go to Clinton,” it was “go to the office and then find out where else I was going” because it was respiratory therapy in a home care center so you typically visit people in their homes. Some of them lived not far from the Canadian border so that kind of a day would start, leave here maybe 6:30-7:00 am, get home 12 hours later and cover about 400 miles, which was unusual. I would put between 40 to 50 thousand miles a year on the car, which luckily I enjoyed. Commuting from here to Utica is not what most people would consider commuting. The scenery is pretty, the traffic is light, main thing is the weather. I got stuck twice. Not bad. I did get stuck once in a patient's driveway. I resented the fact that he didn't help shovel me out. I mean, the fact that he had one arm and two bad lungs I don't think was an excuse. He should have been out there. Why did you keep that job with that clinic when Bassett is closer? I did some training at Bassett but they never had an opening that appealed to me. I would have had to start working the night shift which I don't care for. In a teaching hospital, especially, it's hierarchical. You have residents who are trying to learn, which is good but they will give orders which may not make sense. Whereas, in home care you're more by yourself, which has its appeal and you get to see people in their homes, like you're doing right now. Much different from just seeing them in a hospital bed. What were the interactions between patients, without giving identifying details about them, but going to those areas and meeting people in their homes? Christmas was good because people would bake things. There was a good deal. There was a lady up toward Chittenango made really good apple pie. You might go to a house and not see the dog and you think the worst and indeed the dog had passed on since the last time you were there. Things like that. You see people deteriorate, which is hard, but you're impressed by their courage, in the face of what is usually a terminal illness, their spirit. You arrived here in 1975 and you mentioned that a lot of changes have happened with the land and agriculture. The farms tend to go out of business. As you drive around you'll see barns falling down. Since we have come here a lot more barns have fallen down, the lumber has just been hauled away. There aren't as many dairy farms and the ones that are here are larger. Did you come over Murphy Hill to get here? Came down a steep hill to a T-intersection and then turned left? Then on your way up, you passed corn fields, which I think have mostly been harvested. That used to be a farm. Now they still grow corn obviously, but I heard that the corn is transported all the way to I think it's Cooperstown-Holstein Corporation, which is-- have you ever been to Brewery Ommegang? OK, then you went close to that farm. So, the farm is so big, and I guess successful, that they can purchase corn way over here and haul it by truck over there to feed the cows. So there's still a lot of mostly corn being grown but it tends to go to cows, perhaps many miles away because the farm, the original farm, has gone out of business. What reasons do you think caused the decrease in farms? Whoever interviews Jack and Norman VanBuren will get a much better account. Dairy farming is goofy. The milk is priced by the hundredweight rather than by the gallon. And the price is set in Washington. So, if the price exceeds the cost of production, you do well. If it's below, you're losing money all the time. And I don't know why but for many farmers the answer to that is buy more cows, make more milk. But you're losing money. I don't know. I don't know how it works. And it's fluid, milk, unlike grain. You can store grain in a huge silo until the price increases. You can't store milk; it has to be kept cold. You can make cheese, you can make butter. Fluid milk is tough, tough business. As I said, cows have to be milked twice a day whereas if you're raising beef cattle you don't have to have nearly as much involvement. Have you seen that change in interactions with the people here even though you firsthand were not involved in this? You hear it talked about. There's a farmers organization that is now talking about suicide among farmers. I haven't heard that right around here but in Schoharie County, for example, which is not that far away. It's a way of life. It isn't like some other pursuits where you say, “Well, this isn't working out economically. I'll go do something else.” It's hard to make that transition. Even when a farm was operating chances are that a farmer or his wife, or both, would have to have jobs off the farm in order to keep the farm operating. You asked me to remind you about garbage burning. Garbage burning, yes! About 20 years ago, well, many people would get rid of garbage by putting it in a metal 55-gallon drum and setting fire to it. There was a man in Milford, I can't think of his name, he was on the county legislature. We were talking to him about burning garbage and he said, “Once a week I put all my papers in the drum, pour in a pint of gasoline and throw in a match,” which must've been exciting to say the least. That would have burned the papers rather quickly. It was just papers. It wasn't a good idea, but what was happening around here, people would put food scraps, plastic, any sort of waste, set fire to it, and it wouldn't burn up, it would just smolder for hours. So, in the summertime you're sleeping with the windows open, you might wake up in the middle of the night with stench coming in, slam the windows. The worst offender lived in one of the more dreadful houses going south on [Route] 166, the doctor's house, which I showed you before. The people who lived there were remodeling the house so they set up a trailer temporarily. Anyway this foul air was coming in their four-year old son's bedroom window. Scott went over and actually stomped on the barrel to put it out. Eventually there was a trial. Setting it up was difficult because no one wanted to preside over it, because the local town justice also set fire to his garbage. Anyway, a jury of the garbage burner's peers found him not guilty. The prosecutor was from Albany; he couldn't believe it. The problem was eventually solved when the Department of Environmental Conservation in Albany just banned it. Before that it was nasty. The town supervisor at the time burned garbage. When we appealed to State Senator [James] Seward he said, well, this should be handled at the local level. And the town government said this should be handled at the state level. Nobody mentioned the county, I'm not sure why. I think the two of them knew the positions of each other. They sort of cancelled each other out, never got solved. But that is all behind us because now we have recourse if someone were to burn garbage you could call the sheriff. But very few people do it anymore. So that's good. I'm not too familiar with garbage burning so I looked it up to see what the laws were and now that they exist, there's a pretty hefty fine with it starting at like a minimum of three hundred seventy five dollars. I think there are some exceptions, I think, if you're in agriculture. True. You can burn brush, but I don't think you can burn garbage anymore. It's kind of sad really, the deputy sheriff came once and looked in the offending barrel and said, “Yup, you're burning garbage." Nothing happened. Before the trial. It wouldn't have been that hard to collect evidence. You bring a sturdy metal container with a tight-fitting lid, scoop out the material, put it in [vocal popping sound], take it to somebody who knows what he's looking at, “Yep that's garbage alright.” But things are so much better now. The corner store is kind of the center of the community, and I hope they remain in business, they've changed hands but it seems to be going well. No no no, they never did. Not everybody did. You said “we” appealed or “we” tried to take action about it, when you say “we” did you mean the Democratic Council? Not so much one party, I think, again, it may have been the deputy sheriff came around taking statements from people and we were both at work or otherwise our names would have been on whatever it was. It was hard, you don't like to go against your neighbors, but when things are bad enough you sort of have to. Were there many controversies or antagonisms like that, besides garbage burning? No, I can't think of anything else like it. You said the corner store was like the hub of Roseboom. When we moved, Bob and Delores[Dolores?] Weeks were running it, so it is still Bob's Country Store. They were helped by their son Tom. He eventually took it over and he sold it a few months ago now. He still lives in town and, oddly enough, now he's gone to work at Price Chopper in Cooperstown. His name is Tom Weeks? I haven't met him yet. He hasn't been working there that long. He's a good guy. There's a post office in there, right? There is. It isn't officially a post office. It is a facility of, I guess, the U.S. Postal Service. It's in one corner of the store so you can rent a post office box there, which obviates having to have a mailbox and making sure it's the right height and shoveling it out. If your mailing address is Roseboom, it means you have a post office box. If you have a mailbox, then your mailing address is something like Rd 3 Cherry Valley, which leads to some confusion. Good steaks at the store, good subs. I went there after we talked, and talked to some of the people, and it seemed like a convenient place to meet people and just get anything you need. Pretty simple. Our son was sending us wine from California, which has to be signed for, so the UPS man can't just leave it. You have to know when he's coming and we were going back and forth, “When is he coming.” I explained the situation to John, who was working at the store then, and he said, “Oh yeah so-and-so” [imitates phone with hand] “You got wine for the Willcox's? When are you going to be there?” Cool? Yeah, that's pretty cool. Very personal touch. —Tom, and she was working at the store a few years ago when she was interviewed, it may be a TV station, I'm not positive. But anyway, she said, “Yes, we know a lot about a lot of people, which is both good and bad.” How are we doing for time? About halfway, 30 minutes. Just to switch it up a little bit, you mentioned that you're a part of the Unitarian Universalist Society of Oneonta. So how has your affiliation with that church and religion influenced your way of life? I kind of had the way of life before I had the religion, so it hasn't been that big a switch. I get involved with things I would not have otherwise, like they've had vigils for Standing Rock, which you may be familiar with, and rallies, whatever, for LGBTQ issues. Church is really big on that. I'm 28 miles from the church, whereas a lot of the people are professors or former professors of the two colleges so they're more centered in Oneonta. But a lot of nice people. Nadene is still with a church we were in more than 20 years in Cooperstown, that's Christ Church Episcopal, kind of up the street from the hospital. They're quite different. What was the reason for the switch over? Oh, lack of faith. The Episcopal Church is a creedal church, you stand, recite, “We believe da-da-da-da” and I thought to myself, “Do I really believe that?” And I said, “Nah not really.” I did kind of an exit interview with the rector at the time, I felt I owed him that. Some people just drift away and you don't know why. Let him know where I was at and headed south. So was the creedal faith of the Christ Church something that you grew up with? Actually, funny you should ask that, I grew up in the Congregational Church, which, when I was a youngster, became the United Church of Christ. They are in between Unitarian Universalist and certainly the Episcopal Church, leaning more toward the former, I would say. Sometimes Unitarian Universalists describe themselves as “Congregational Lite.” Nadene and I started attending the Christ Church Episcopal in Cooperstown when the brother of one of her co-workers died fairly young. He was a biker. For the funeral, they had his Harley polished fairly well, an American flag on the seat, and his ashes. Father Doug Smith was the rector at Christ Church at the time, and he made that into something meaningful and Nadene said, “Wow, this guy's good.” And our children were at a certain age. I think many parents if they hadn't been to a church when their kids get to a certain age, you think, “You know, we should at least expose them to this.” So we started going there. How old were your children at that time? It was more than 20 years ago because Nathan is thirty-nine. It was more like 30 years ago, because Nathan was probably nine. They would've been six or something like that, maybe a little older. You're involved as the board liaison for the endowment committee at the [Unitarian Universalist] Society. What kind of responsibilities does that entail? There is an endowment and the committee is allowed to spend the earnings from the endowment. I think that's the way most endowments work. You don't dip into the principal, you can spend the earnings. People apply for various projects in the community and usually within a radius of Oneonta. That's pretty much it. It's fiduciary. How do you decide which organizations or initiatives to help out? This year we had enough money so I don't think we had to turn anyone away. It isn't a lot of money but it helps. You're reached out to by these various organizations? No, we put out a notice saying applications are due by “da-da-da.” In other words the endowment committee has been in business long enough so various nonprofit organizations know about it. I'm also the liaison for the safety committee which is potentially meaningful. That's not a strong enough word. We're talking about fire drills or what happens if somebody has chest pain, but obviously after Squirrel Hill, Pittsburgh a lot worse things go on than fires and [whispers] chest pain. So how do you deal with those things that shouldn't be a part of reality but that deal with security? We're still formulating policies. I sing in the choir. So you are facing out toward the congregation and the main door to the church, and I just kept my eye on it. I don't know what I would have done. It makes you think about things. I don't foresee an armed guard or locking the doors or anything like that. There'll be serious conversations because that church is the most likely one to get hit in Oneonta. Upon the steeple we have a Black Lives Matter banner and we're out there supporting marginalized groups. I think the chances are low of our ever being attacked, but you never know. You're also on the [Roseboom] planning board. That is true, that is true. That has a history also. I was on the planning board, but a different version of it many years ago. It was initiated because the town board, which is the elected body, was afraid that developers would come from the city, capital 'T' capital 'C', put in housing developments and demand sidewalks, streetlights, sewerage, whatever, which the town couldn't afford. They said well, we've got to have a planning board so we have some regulations. They didn't realize that any plans would apply to everybody not just the newcomers. We decided on a minimum lot size and one lady said, “Wait a minute, I want to be able to divide my land up among my three sons.” You don't have enough land. We decided that the planning board didn't have the backing of the town board so it just kind of dissolved. Now it's been set up again, moving slowly. We have been lucky in that we haven't had pressure from outside that would entail a lot of planning. For example, you're familiar with [the Cooperstown] Dreams Park? That was a huge change for that township. Larry Lamb was on the planning board down there and now he's the head of the planning board up here and he talks about his experiences. They were just this poor little town trying to deal with a huge development. Talked about gentlemen coming in in very nice three-piece suits, very nice attache cases, and getting paid a great deal per hour. What's the town supposed to do about that? Again, that hasn't happened here yet. One of my housemates is interviewing somebody that said “Baseball has been a source of problem for the town but also saved the town.” Would you agree with that statement? [noise] It certainly brings in the tourists, which is good. Again, the hospital is the biggest employer. That'll be an interesting interview depending on whom it's with. But the streets are very crowded in the summer. They've had to institute paid parking and you see the shuttle buses. All in all, it's good because if you want to see a community that relies on agriculture, Richfield Springs. Have you been? It's quite different from Cooperstown. They had a tourist trade in the 19th century because people would come up because they thought the sulfur springs were healthful. But now there are a lot of empty storefronts, again the farms are failing, and they don't look like Cooperstown. That'll be an interesting interview. Is the planning board related in some way to the [Roseboom] Historical Association? So how did you get involved with the Historical Association? The building is the large white one which I think you can see, with the metal roof. It was in danger of falling down, the building itself. Before it was owned by the Historical Association it had been a Baptist church. Two of my neighbors were instrumental, actually, crawling around in the crawl space and just shoring the thing up. Vivian Langdon was the impetus behind it. She's since deceased, wonderful person. She kind of, I guess, established the Historical Association and I think I got involved because somebody moved away and asked me if I wanted to join so I did. I know you guys recently had “Roseboom's Past,” it was a talk or a panel. Yes, a panel of old timers. There's that and there's the annual breakfast. I was just looking through the Facebook page to find various events that are going on. Yes. Some of them don't actually go on but that's alright. Somewhere you look and it says every month we have the Vivian Langdon lecture, we don't. We try to get lectures. We've had John Davis who wrote a history of Bassett hospital. We've had Al Bullard talk about hops. He knows everything about hops, which is ironic because he doesn't drink. So how do you work to keep up events and engage the Roseboom community? We try. I don't know, we wish we had more members. The core group is only about half a dozen people. People are busy. The opera rehearsals, they're a little bit in the summer. The young artists, they love it there [looking at the Roseboom Historical Association building], I don't know why. It's like singing in your shower because it's all wood. With the voices they have, they like it. You can sit on the patio and it sounds great. You can hear them from here? Oh yes, especially in warm weather with the windows open. Those kids have got some pipes, I mean they can fill up the opera house and over there [explosion noise]. Unfortunately, you almost never hear an aria. They're practicing certain sections; I'm trying to think of an analogy. Football players have a kind of a sled thing that they ram into. Watching them do that isn't that exciting, it's not like watching a football game. Listening to the kids just rehearse very difficult passages is not as much fun as actually going to hear the finished product. But they have done some recitals here, been a lot of fun. You said you were a singer and did that start when you were in high school or when you were in college? Yes, in high school. We had a community choir that did virtually all of Messiah and sang in college. That's where I met Nadene. It's now Binghamton University, the undergraduate liberal arts part was called Harpur College, H-A-R-P-U-R. That's where we met. Sang a few times with Catskill Choral Society, mostly Voices of Cooperstown. We're doing Messiah in December, so you should definitely come. Nadene will be taking tickets, I'll be up on the risers. That's on December 15th right? You still stay involved with the Christ Church in terms of Voices of Cooperstown? Voices of Cooperstown was begun primarily by the late Bruce Harris who went there, and so we have always rehearsed at Christ Church and we've always given the performance there. We're kind of under their umbrella. It used to be that the church choir would rehearse at 7pm on Wednesdays followed by the Voices of Cooperstown at 8pm. It was kind of a long day because most of the people in the church choir were also in the Voices of Cooperstown. That's not quite true anymore, but that was the connection I still get along with everybody. You mentioned that you were poll watching yesterday. And that's because you're involved with the Democratic Council? Otsego County Democratic Committee. Good old OCDC, which sounds like a diagnosis of some sort. I was there from about twenty after 6am until twenty of 6pm, all day. And the ladies, bless their hearts, I was just a poll watcher there. What are they called, voting inspectors? Anyway, they go through training and the polls opened at 6am, they were there before 5am to get everything ready and they weren't going to be through till probably 10pm because the deputy sheriff has to come and actually collect the paper ballots. It's a long day. So what are some responsibilities or key issues you work with with the OCDC? Now that the election is over? I don't know. I've only been on it when we were moving toward an election so I don't know what we'll do now. Argue amongst ourselves. Luckily, [Congressman-elect Antonio] Delgado won because if he hadn't won [mimics people bickering] “Well, we should have nominated someone that did that, did that, would have won.” He did, so it's okay. He didn't win in this county but he won overall. Actually, I don't think any of our local people won. But the registration is quite a bit more Republican than Democrats. It's okay. So did your ballot go through? Do you know? I can call tomorrow or the day after and find out, but I don't know if it'll make a difference. The Alabama elections were sad to watch, to say the least. Well, we've about 10 minutes left. I was going to ask if there was anything that you would like to share, something I had left out, you think. We can still talk about snow tires but you don't have to record. No, I can't think of anything. I'm really glad that John went and contacted Mr. Walker, I think this is a good thing to be doing. I was invited to do it many years ago. I felt I would be imposing or something, asking people questions. I could have interviewed Betty and Ken Bolan, who live across from the store. They went back a lot further than I did. So you wanted to conduct an interview? I can't think of his name. If I said it and you repeated it over there [CGP] they would say, “Oh yes.” Anyway, he wanted me to do it but it didn't sound like fun. I should have. I wasn't in the Program, I think I was in library school, that's it. And they have a book restoration program over there but he said, “Why don't you do oral history.” I can picture his face I can think of his name. Was this a faculty member? Yes, he's a very well-known name in Cooperstown. So being in library school opened you up to that sort of history? My favorite course was history of books and printing. The instructor was excellent. He talked not just about books but about church history and so on and so forth, which made no sense at all because that's when computers were beginning to be used in libraries. Of course, I avoided that course. If I'd been smarter, I would have taken that but I didn't, so here we are. They were working on behalf of the developers. The town didn't have the legal firepower to match that. It wasn't shady, it was perfectly legal. Intimidating. How do you think this sort of intimidation or the difference between the local and people from outside affects the ongoing of a small place like Roseboom? There could be friction between the city people and the local people, but sometimes- I mean, the really bad garbage burner was from Dutchess County, the person I was referring to before, so it depends on how they fit in. How much time we got? I have to tell you about Henry. Henry was a Chesapeake Bay Retriever. He's about 110 pounds, no fat. People can tell you Henry's stories, like he was good-natured but he was protective. Like one night, I was walking him through the cemetery and there were two boys probably 13, 14 and they had a radio control car and they were operating it under the streetlight. We were in shadow and Henry just said “Woof. '” They knew who, but they didn't know where. They disappeared immediately. Because they knew Henry and he wouldn't have hurt them but they were just worried. I wasn't here for this but the people across the street were, but one of the boys who was running the radio controlled car, he wound up in the middle of the road being sexually assaulted by Henry. Dogs are like that. I guess there was a car stopped in either direction so that was the entertainment for a while. Henry was a piece of work. He was our dog. Oh yes. Until he died of cancer at age 8. He got in a fight with a beaver once. Beavers slap their tails. I always thought they did that to warn other beavers, where this beaver was more like “Come on, this is my pond let's see what you got.” Chesapeake Bay Retrievers love to swim so Henry thought it was his pond, so he went out, it lasted just like a few seconds and then they went in opposite directions and Henry had a cut lip, stuff like that. But we got an Airedale after that, he died of cancer at age 8 and that's heartbreaking. So we haven't had a dog since. I have a cat, I've had luck with cats. Have you always have a pet at some point? Well is there anything else you want to say? I think we've done it. The hour just flew by. I think we've done it. OK. Well, thank you, I really did enjoy this, thank you for the time. Appreciate it. 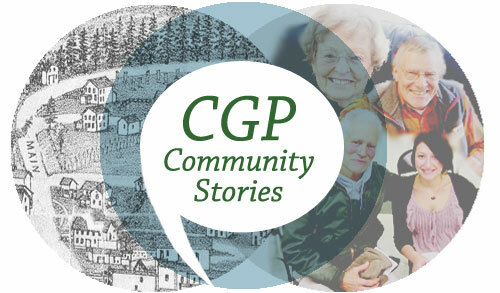 Shivkumar Desai, “Keith Willcox, December 16, 2018,” CGP Community Stories, accessed April 25, 2019, http://cgpcommunitystories.org/items/show/367.